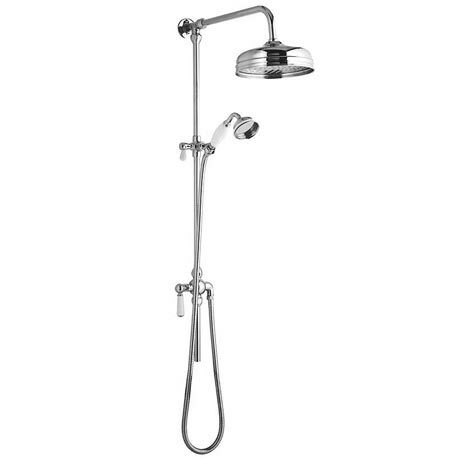 The Hudson Reed Victorian Grand Rigid Riser Kit with Shower Rose - AM312 has a 8" in diameter shower rose. It has a built-in diverter so you can switch between the fixed head or hand held shower. The turn of the century evokes a feeling of greatness, an era when engineering was the world's driving force, and this sense of achievement is replicated in our collection of traditional styled rigid riser shower kits. Q. can it be used with a combi boiler? Bathroom is also downstairs. Hi Ali, yes this will work, however this shower rose needs a minimum 0.5 pressure. Thanks! Q. Can the rigid riser be cut to reduce in height for a bathroom with a low ceiling? Very pleased with my rigid riser, its just exactly what I was looking for! Thank you to everyone at Victorian Plumbing, I will recommend you to all my friends.